We’ve been stuck on the idea of competitive advantage as the key to strategy for a long time now. Paul Skinner thinks it’s had its day. Collaborative Advantage is what Paul describes as his ‘book-worthy’ big idea, and in this conversation he explains how it’s unfolded from a principle that he’s applied and developed through the various initiatives and enterprises he’s worked with over the years into book form. There’s also great advice on creating stories where the customer, not your business, is the hero. Because those are the stories that change lives. Alison Jones: Hello and welcome to The Extraordinary Business Book Club. Today I’m here with Paul Skinner,the founder of The Agency of the Future, which helps clients create collaborative advantage to drive organizational success. He’s also the founder of Pimp My Cause which uses cause-related marketing challenges to enhance the capabilities of individuals and teams and supports over 2000 good causes with access to pro bono marketing in the process. His new book is called Collaborative Advantage: How collaboration beats competition as a strategy for success. So welcome to the club, Paul. Paul Skinner: Thank you, it’s great to be on a podcast that I’ve listened to before. Alison Jones: Aw, it’s always nice isn’t it, “Oh, I feel like I know this person.” Good. Well let’s start by better understanding that brilliant phrase collaborative advantage as opposed to of course competitive advantage. What does that mean and why does it matter? Paul Skinner: Okay, so creating collaborative advantage as I understand it, anyway, and as I’ve developed it in the book, is a process of creating value across the business ecosystem and what you operate and with your customers as active creators of their own value as opposed to simply working against your competitors and for your customers as the sort of passive recipients of value. So as you see it’s a fundamental alternative to competitive advantage. Now, competitive advantage I guess is the idea that a firm should marshal its resources to create a customer offering that is in some way superior to the offerings of other businesses. And while that might sound all well and good I would suggest that it has a number of assumptions inherent within it that no longer really hold. So, where competitive advantage assumes that most value is created within a business, I would suggest that most value is created in the spaces between us. And where competitive advantage assumes that the way to succeed is by being better than others, I believe the way to succeed is by supporting others and sharing the value that you can create with them. And again where competitive advantage assumes that your customer, once they’ve made that all important decision to choose you, then becomes the rather passive recipient of the superior value that you somehow magnanimously choose to create for them. I argue that actually most times it’s our customers who are the people who are doing the very most to improve their own lives. Whether it’s their working lives, or their personal lives that’s most relevant to our particular business. And that our role in business is usually to make it easier or more complete and effective, or in some way more magical, for them to do that. Paul Skinner: So, I spoke a couple of weeks ago about creating collaborative advantage at The Lowry Theatre in Manchester. Or more specifically at Salford Quays. Now, just across the concourse from the theatre is a Pizza Express. Now I would suggest that the value created in The Pizza Express is in some ways inseparable from the value created by the theatre because it’s the promise of a night out at the theatre that gets you to the area and hungry in the first place. It’s inseparable from the value created by the car park underneath the commercial building that The Pizza Express is a part of because probably for a theatre night out it’s somewhere that you’re not able to walk to. And then finally the primary creators of value would be the customers of The Pizza Express because however tasty the American hot pizzas are, it’s probably more realistic that you decide to go on a night out with some friends and then work out where to eat rather than deciding I’m going to go to Pizza Express at Salford Quays and can I drag someone with me? Alison Jones: “I wonder who could come with me,” yeah. Paul Skinner: Exactly. So, my suggestion throughout the book is that collaborative advantage gives us a truer and a more useful way of understanding the value creation process and that if we, based on that truer understanding, ask ourselves better questions about how to enhance that process we’ll find better answers when we’re thinking about how to grow the value of our businesses. And I would say this is particularly important right now because if we look at the context in which most of us are operating, we’re facing so much uncertainty that if we ever did believe that we could sort of perform our way to success and guarantee positive outcomes based on our own performance alone, I think that idea is sort of rapidly evaporating. You know we face such complex problems that… I think all of us face problems where we know that for some aspects of those problems we’ll depend upon the expertise of others. We’re all affected every day, even in ways we don’t know, by actions we can’t see and technologies that we’ll never fully understand even if we’re the governments chief scientist. Alison Jones: It’s a really satisfying way I think, of looking at your place in the world. Probably quite a humbling way as well. I imagine there are many CEOs who would struggle with that but I love the fact that it’s very much holistic and I know I first discovered you through Pimp My Cause. I think I tweeted once that this was the best use of the internet ever. So just tell us a little – because I can see now that you’ve explained that how this feeds in – just tell us a little bit about The Agency of the Future and Pimp My Cause and how they brought you here and also how they’re related to the book. Paul Skinner: Sure. So The Agency of the Future is the business through which I directly support clients and create in collaborative advantage. And actually I often like to understand the word agency in Agency of the Future as referring to human agency or the sort of collective agency through which we can create the future. And practically I spend most of my time at The Agency of the Future supporting leadership teams and everything from start ups and social enterprises to corporates or in some cases to institutions or international corporations and governments. In understanding and defining their purpose differently in the light of collaborative advantage and better mobilizing outside as well as inside the organization around that purpose as a result. And doing that I’ve come to believe that collaborative advantage can be created by any organization of any size in any sector. And so ultimately it can be useful to far more people than I can ever have direct contact with through my client work. So in the first instance the book I hope will be useful as a multiplier reaching people that I wouldn’t otherwise reach and being useful to them through the idea of collaborative advantage in ways that otherwise wouldn’t take place. And of course my hope is that some readers will want to get their organizations involved as clients of The Agency of the Future as well. And then the other side of my activity is Pimp My Cause I would suggest is also related because through my work at Pimp My Cause connecting thousands of really talented marketers with thousands of deeply inspiring causes has made Pimp My Cause somewhat of a living laboratory of collaborative advantage in practice. And I’ve learned so much that has informed the idea from running Pimp My Cause. So I suppose three things primarily. Firstly I’ve often described our causes as sort of ninjas of higher purpose. They each have that one purpose that has brought the organization into being and that they’re supporting day in and day out. And that’s massively commercially variable too. I was reading recently a study by E Why that found on a study of nearly 500 businesses that the businesses that could define and mobilize around their purpose were more successful across every metric that they could measure than those that couldn’t. Two other ingredients our causes are tremendous test beds of collaboration because even quite a small charity has to align the interests of a complex network of stakeholders to survive. They need to support their beneficiaries, their customers, their service users, their volunteers, their individual donors, their institutional funders, their corporate partners and so on. And then in come our marketers with their tools of insight, analysis and creativity and they apply that creativity to the cause purpose to unlock more effective levels of collaboration. So Pimp My Cause has been very much a laboratory of collaborative advantage in practice that has informed and reinforced my thinking at The Agency of the Future. And that provoked me to write the book in the end. The instigation was actually remembering the words of one of my professors at Oxford back in my student days who told me that the difficult thing in writing a book is not the writing of the book but the having of a book-worthy idea. So I’ve been working for years now on collaborative advantage as an alternative to competitive advantage and when we just think about the huge influence that the idea of competitive advantage has had, ultimately seeing that perhaps an alternative better option was available, ultimately it became more difficult for me to not write the book than to write it. So then when I pitched an early short draft of the book to Little, Brown at Hachette and they offered me a publishing contract that just gave me the confidence to go forth, steam ahead and to unlock a further symbiotic relationship between the book and my daily work at The Agency of the Future and Pimp My Cause from there. Alison Jones: And you’re right because as a publisher you can, you read that phrase ‘collaborative advantage’ and it resonates. It is interesting, competitive advantage is sort of embedded into the way we think about business and it’s a bit discombobulating to read that because you think you’ve read it wrong initially and that’s… yeah, it’s really intriguing. One thing that really struck me in the book as well was the way you spoke about stories as a metaphor for business. So you said that marketing isn’t just about telling stories, it’s about inviting people into the narrative. I just wanted to explore that a little bit. I mean, I can see how it works from a business perspective but taking it more literally how do you see marketing and stories developing in the future? And also for people listening that perhaps run small businesses, how can they incorporate that idea of bringing their clients into their narrative into their own marketing? Paul Skinner: Hmm. So there’s a lot to unpack in that. First of all, in terms of storytelling, the evolution of storytelling in brands, let’s begin with that one. So, there’s a Spanish poet and playwright called Federico Garcia Lorca and he once suggested that a play was a poem where the words get up off the page and become human. And I would say that that’s a good metaphor for an early stage of collaborative advantage where you’re successfully mobilizing people within a business, around your brand or your customer proposition. So it’s not just words on a page, but you’re making it human through your own activities. But to really build collaborative advantage I think one difference we have to see is that our customers are active creators of value and have to be the heroes of the story, not us as businesses. So there is an interesting piece of theatre called You Me Bum Bum Train, I don’t know if you came across it. Alison Jones: I have genuinely never heard of that. Paul Skinner: What was unique about that was You Me Bum Bum Train invited audience members to come centre stage and it gave each audience member two things. It gave them a problem to solve and it gave them a character in which to solve that problem. Now, I would suggest we’re all playing roles all the time. The fact that I know this is a conversation for a podcast means that I wouldn’t for example say “Could you just hang on a minute while I put the kettle on?” Which I might do if we were having the same conversation which we might very well do but without the context of the podcast. So I would say if we can help people to understand their context differently and create active roles for themselves to play in that context as a result, we’re well on the way to creating collaborative advantage and that might be how things like cross fit work for example. By reimagining physical training as an exciting form of sport. Or Stoptober, the campaign that makes it easier for people to stop smoking by creating that context that makes it easier for people to think of stopping smoking, to ask for support, to offer support, to help each other over the line and so on. So that’s probably how I would see the role of storytelling changing with collaborative advantage. Alison Jones: That’s fascinating because one thing that I know many businesses do is they try and invite users to respond and to generate user generated content and so on but you’re saying that there’s no point in doing that in a vacuum, you have to create a contest, a narrative, within which it makes sense. Paul Skinner: Absolutely and I would also say, challenge a couple of things in terms of marketing and content. So if we think of marketing as content then the aim of marketing is to be relevant to an audience and once again that assumes the audience is somewhat passive. So quite often in marketing it can be useful to think how can we replace the concept of relevance with the concept of utility being more useful to people. And if I’m standing in the concourse at Houston Station I don’t want Virgin to communicate a relevant offer to me but if they make it possible for me to know which platform my train’s going to be leaving from before the stampede than I’m quite interested in that. And then kind of pushing back in terms of marketing because marketing is kind of permeates the book but I would say that it is marketing for leadership teams, not just for marketing teams. So, if we look at the concept of competitive advantage that was actually pioneered primarily by financiers who brought an understanding of control mechanisms to bear on enabling senior business leaders to better understand which of their business units were creating value or losing value and so on and to better allocate resources accordingly. And that might be why the big strategic advisory firms are to this day somewhat dominated by financiers. It almost suggests that in our evermore interconnected world where more of our value is created through our relationships and proportionately less of our value is created through what we control, marketing should be taking a more central place in the role of strategy in the first place and that might be why some of the big strategic advisory firms are buying up digital and creative agencies for example. So, the range of problems marketing can be used to solve is probably much bigger than the range of problems that the marketers in our businesses are usually asked to solve. Influence is essentially the answer to questions like how can we grow our businesses more quickly by working right across our business eco system and with our customers as creators of their own value? Or thinking more with my Pimp My Cause, how can we better address social challenges by better harnessing our collective agency? Alison Jones: Because it’s all about capturing attention, isn’t it? In fact even when you think of it, yes it’s interesting when everything is visible, everything is marketing in a sense, isn’t it, because you have to be aware of how that plays out in that bigger narrative. Paul Skinner: Right, and it begins I suppose by overcoming the cognitive bias that we may have inherited from competitive advantage that we essentially solve our own problems. So if we recognize that there is more value created outside our business than inside it, then the question of practicality and how do we grow a business becomes how do we identify and understand that outside value creating potential and bring that inside the business. So there is a framework used in the book that can help any business to create collaborative advantage by supporting them in doing things like building common purpose with their key stakeholders and customers. Creating opportunities for their partners and customers and collaborators to pursue that purpose alongside them. Making the environment more conducive to that kind of participation and partnering up to achieve scale more quickly, more extensively than any business could acting on their own. Alison Jones: It’s a really fundamental and exciting shift but tell me once you have that publishable idea, as your professor said, let’s go onto the writing for a minute. Tell me – because unfortunately that isn’t enough is it, it’s a necessary but not a sufficient condition – so tell me what writing actually looks like for you. What’s your routine? What have you discovered works for you to get you started and keep you going? Paul Skinner: So I suppose the primary thing that really keeps me going is the topic is of such deep rooted interest in me. So the fact that it’s something that I’ve worked on for a number of years now and that I really believe in and that permeates all of my working activity really makes the writing much easier. And I’d also say the fit between the content and sort of my deeper understanding of who I want to be in the world and what I am most attached to achieving. So I don’t often talk about this in a sort of work related discussions, but I have a very long standing practice of meditation, and I’ve been meditating every day for 20 years or more. And in fact early in that process I took the equivalent of a gap year to spend literally a year meditating for seven, eight hours a day in a forested mountain valley. Alison Jones: Yeah, and that’s part of the problem isn’t it? When you’ve got a massive topic and you and I have just demonstrated that actually this reaches into every aspect of the organization. In a sense that’s a separate challenge is scoping the thing and saying this is the line and I’m not going to go beyond this because this needs to be a book you can actually physically pick up. Paul Skinner: Yeah, I think that that’s absolutely right. I mean it also is humbling in the sense that every instance of creating collaborative advantage will have its own particular challenges. So you have to approach every situation with universal frameworks maybe that could make it easier to address each new situation but with an openness to understanding the particularities of each group and their own desires and preferences. So to give one example, in the UK we are culturally very relaxed about the idea of closed circuit television. We have huge amounts of it. But it would be really difficult for us to imagine being forced to carry identity cards. In Germany, very easy for people to be persuaded to carry identity cards but much harder to get them to accept CCTV. Alison Jones: Yes. Interesting cultural differences. But how did you go about doing that scoping thing? When you sat, did you sit down and plan the book or did you start writing and kind of let the structure evolve as you wrote? Alison Jones: I’m a big fan of that structure by the way. It’s that Rudyard Kipling thing isn’t it, the six honest serving then. I think it’s such a great, start with why and then develop on from there. I loved that. Paul Skinner: And it sort of relates to the ideas of purpose, creativity, and collaboration as well because in a sense our why is our purpose and creativity answers our how and collaboration is the what that we’re trying to achieve. So that structure made it a lot easier. In terms of the genesis, it was, I’d become increasingly frustrated that I hadn’t written a book on collaborative advantage when I spent so much time working on it. So actually eventually I decided just to take a week off work and to write up the concept in a sort of book shape. And that kind of worked out okay. So a few weeks later I took a little bit longer off and wrote a more complete draft which is the draft that I sent to Little Brown at Hachette. And then when they came back and were excited to develop it as a book that gave me the confidence to flesh out the full structure. And then the writing process was surprisingly straightforward in some ways. Partly also because you know as a believer in collaborative advantage I don’t do anything myself so I was drawing upon my client work, drawing upon the work of people across my networks at The Agency of the Future and Pimp My Cause and illustrating the idea of collaborative advantage from so many angles by having a window of all of those spheres of activity. Alison Jones: Yeah, brilliant. Walking the talk. Wonderful. Now, I always ask people to recommend someone onto the show Paul. So who would you recommend that I invite as a guest onto The Extraordinary Business Book Club? Is there something with something interesting to say about the business of business books? Paul Skinner: Yeah, so as I mentioned I enjoy listening to your podcast as well as today enjoying the unusual pleasure of being on it. So I know that you want to find a good guest and also a book recommendation. And if I may put all my eggs in one basket, I would like to recommend Vincent Deary as a guest, and his book How We Are as a book for listeners to check out if they’re interested. I would make a distinction between business books that I tend to be reading less of and books for business that I tend to be reading more of. So, because collaborative advantage begins with the unknown in terms of begins with other people, I am very fascinated by reading more and more about human insight. And that’s really important to me. 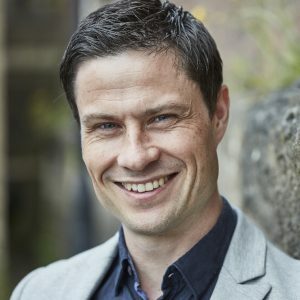 Now Vincent Deary is a practicing and academic psychologist based at The University of Northumbria and his practice is dedicated to helping individuals change their lives for the better. Usually in his case, most commonly, when they’ve been affected by a problem, or a whole cluster of problems in their personal lives that threaten to make their lives very much worse, whether it’s bereavement, difficult change in career, problem health issue, an addiction and so on. And so his book, How We Are, sort of wonderfully illuminates the cognitive process of being human. He can describe very simple things like going round the corner to the newsagent to buy a pint of milk, but he brings it to life and sort of illuminates the experience and consciousness of doing that such that every time you put down his book you feel twice as alive, twice as human, twice as able to understand anybody that you might meet. And why I recommend him as a guest for the show is that he actually takes his own process of writing the book to improve his own life as material for the content for the book. So he brings to life the particular challenges that he faces as a writer. How he organizes himself to overcome those challenges and what makes it easier for him to face up to what he finds at the start of the process to be a really daunting challenge. So I think he would be a wonderfully humanizing guest and if you do have him on the show I’ll certainly look forward to listening to it. Alison Jones: What a great recommendation. That sounds fascinating. I’ve never heard of Vincent Deary. I don’t know the book, How We Are, but I love the title, and I’m really looking forward to reading that. Thank you. Alison Jones: Now, Paul if people want to find out more about you, and Collaborative Advantage, where should they go? Paul Skinner: Well anybody can connect with me on LinkedIn that’s listened to the podcast or read the book. If people are listening to this podcast before the 22nd of June then they can drop me a line through LinkedIn, there may be some places left for the book launch at the Museum of Brands. I’m speaking the following day at the cooperative congress, the 23rd of June, also in London. If people would like to find other speaking engagements or add to them or contact me about services at The Agency of the Future, that’s www.theaof.com. People can follow me on Twitter @ipaulskinner and if people would like to get involved with Pimp My Cause, that’s www.pimpmycause.org. Alison Jones: Fantastic. I will put all those links of course up on the show notes at extraordinarybusinessbooks.com. Giving you more URLs to think about. That’s brilliant. What a fascinating conversation Paul. Thank you so much. It was a real pleasure to talk to you today. collaboration, marketing, publishing, stories, strategy, writing. Bookmark.